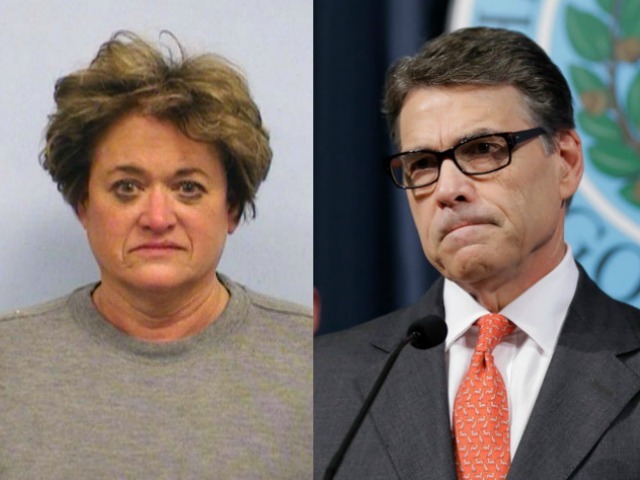 AUSTIN, Texas — A grand jury indicted Governor Rick Perry Friday for his attempts to remove Travis County District Attorney Rosemary Lehmberg from office after she was arrested for driving while intoxicated last year in a case that made national headlines. In April 2013, Lehmberg was arrested after a witness called 911, describing her as driving erratically, swerving back and forth into the bike lane, and into oncoming traffic. Officers at the scene reportedly found an open bottle of vodka in her car, and a blood sample obtained later that evening purportedly showed a blood alcohol level of 0.239–almost three times the legal limit–even that many hours later. Lehmberg’s sentence, a fine and 45 days in jail, was most likely the highest in history in Travis County for a first-time DWI charge. The investigation into her case also revealed a less-than-flattering picture of her drinking habits. Subpoenaed receipts from Twin Liquors showed her buying 72 bottles of Cirroc vodka–totaling more than 23 gallons–in a 15-month period, and that Lehmberg spread her purchases out among different stores. This amount only covers purchases made with her credit card at that one liquor store chain, not cash purchases or alcohol obtained elsewhere. The Texas Local Government Code, in Chapter 87, allows public officials like district attorneys to be removed from office for “incompetency, official misconduct, habitual drunkenness, or other causes defined by law.” The 1987 revision to the law added a single incidence of intoxication on or off duty as a potential cause for removal. However, because Lehmberg is a Democrat, elected in Travis County, one of the most Democratic-heavy areas of the state, and Governor Perry, a Republican, would be able to pick her replacement, other Democrats quickly rallied to her defense. Other prosecutors who worked under Lehmberg publicly supported her remaining in office, as did State Senator Kirk Watson (D-Austin). Frustrated with Lehmberg’s refusal to resign and maintaining his position that someone who had committed her offenses was not fit for office, either as the district attorney or as head of the Public Integrity Unit, Perry then announced plans to veto funding for the Public Integrity Unit unless Lehmberg resigned. Texas law clearly grants the governor the power to veto funding for the Public Integrity Unit and many other agencies, but Democrats supporting Lehmberg howled in protest. The Travis County District Attorney’s office has a long history of politically-motivated prosecutions, including the 2005 indictment of former U.S. House Majority Leader Tom DeLay for alleged campaign finance violations. DeLay’s convictions were completely overturned and he was acquitted after an appeal to the Third District Texas Court of Appeals in 2013–too late to save his political career. The grand jury’s indictment today, under the supervision of appointed special prosecutor, Michael McCrum, starts the process for a criminal case against the Governor but by no means guarantees that an actual criminal conviction will result. The grand jury process is entirely one-sided, controlled by the prosecutors, who present only their side. There’s a famous quote from Tom Wolfe’s book Bonfire of the Vanities, noting that prosecutors have so much power over this process that they could “indict a ham sandwich” if they so chose. Perry’s office released a statement, through his general counsel Mary Anne Wiley, stating that the governor’s actions were allowed under the law and that they would vigorously fight these charges. In the meantime, Lehmberg is facing a new set of legal troubles, as an ethics complaint was filed against her last week, accusing her of failing to properly report on her campaign finance reports the source of the more than $227,000 in attorneys fees she paid to her defense counsel. The complaint was filed by Austin attorney Kerry O’Brien, the same attorney who had previously filed a lawsuit to have her removed from office, under a provision of Texas law that allows any Texas citizen to bring such a suit against a public official who is unfit for office. The specific allegations of the complaint note that Lehmberg’s campaign finance reports note a $227,885 legal bill due to the Austin-based law firm Richards, Rodriguez & Skeith, some partial payments on that bill totaling $16,060, but do not indicate the source of the funds. Lehmberg has said that she intends to raise contributions to cover the remaining $211,825 still owed, but has not yet reported any such contributions. The Texas Ethics Commission has five days to determine if the complaint against Lehmberg is sufficient to move forward with an investigation. Breitbart Texas will continue to follow this story. Sarah Elizabeth Rumpf is a political and communications consultant living in Austin. You can follow her on Twitter at @rumpfshaker.